FIXYOURTHINKING.COM / Need a brain? Borrow mine! 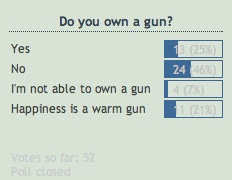 : The Gun Poll! I had the most votes in my latest poll of any poll I've done yet. The question was, "Do you own a gun?" The question has been in my mind over the last two weeks as the United States Supreme Court debates whether or not the 2nd amendment means that Americans have the right to own a gun. I have recently purchased a gun and enjoyed going out with my best friend to go to a shooting range to fire. I'm going to go to a "Conceal & Carry class" in April - to learn responsibility of ownership and proper handling. Amendment II from The Bill Of Rights – Right to keep and bear arms. I don't really understand the debate here or why there is a misinterpretation by any one.